Memorial walk and plaques dedicated to Olympians from Townsville. The feature, known as The Walk of Fame, was launched in 2004 to coincide with the Athens Olympic Games to honour the city’s rich Olympic history and its athletes. 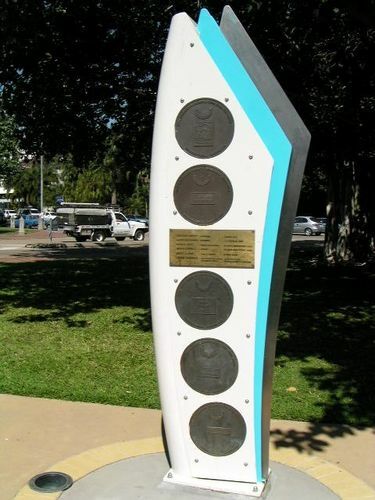 Commemorative signage recognised eight Townsville born or raised Olympians based on advice from the Queensland Olympic Commission. Townsville people already recognised on the Olympic Walk include Laurie Lawrence (swimming coach), Summer Lochowicz (beach volleyball), Barry Malcolm (hockey), Jim MasoN (hockey), Glenn Buchanan (swimming), Renita Farrell (Garard) (hockey), Russell Perry (weightlifting), Brett Clarke (table tennis), Mervyn Crossman (hockey), Lesleigh Harvey (Mayes) (swimming), Helen Gray (Johnson) (swimming). In 2014 names from the 2008 and 2012 Olympics including Natalie Cook (volleyball), Rob Hammond (hockey), Jarrod Bannister (athletics), Lisbeth Trickett (swimming) were added to the walkway.